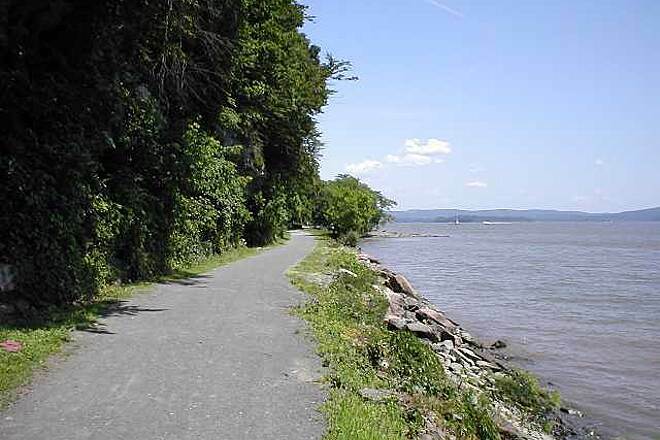 While not a "rail-trail," the Hook Mountain/Nyack Beach Bikeway is a very scenic trail along the Hudson River in Rockland County. 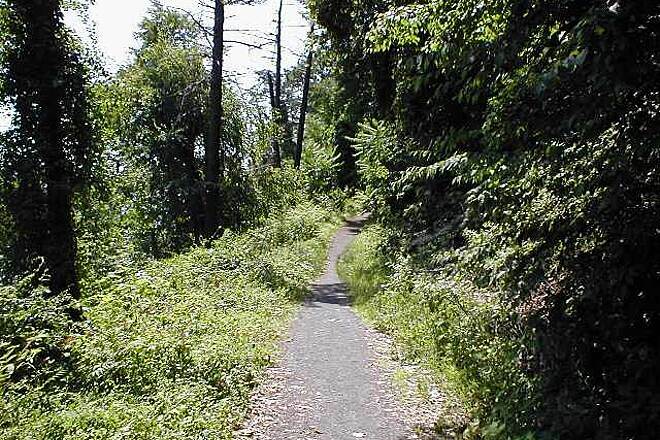 The southern half of this trail is flat and runs right along the river at sea level. 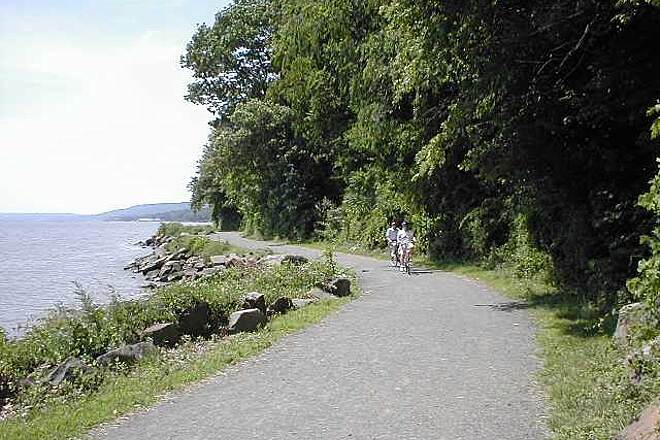 It is wheelchair accessible from the parking lot at Nyack Beach State Park and even beginner bicyclists can easily travel on it. 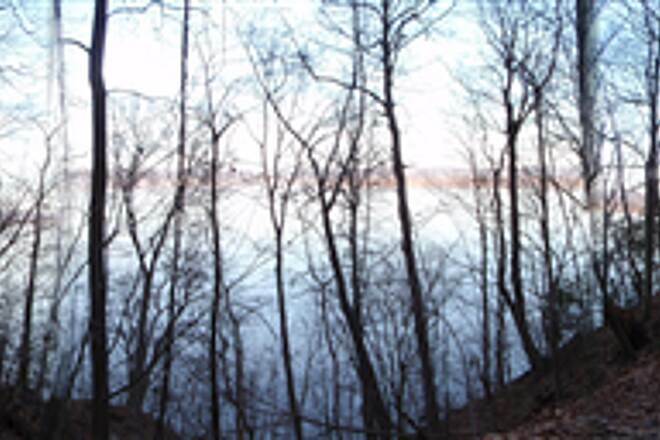 There is a paved connection to the Rockland Lake State Park area from this trail. 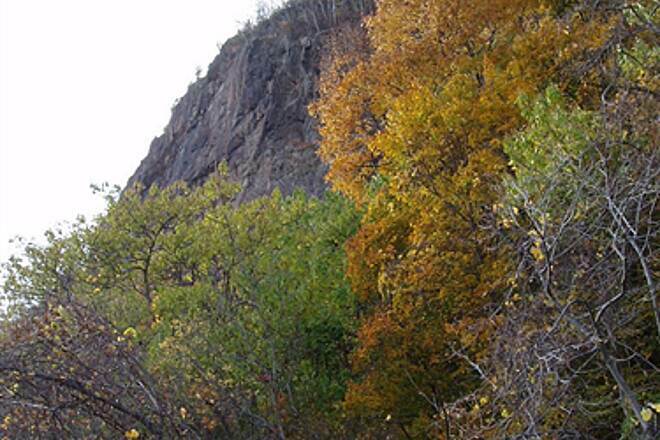 The northern half of the trail is hilly, narrow and quite rocky. It runs along the cliffs and should only be ridden by experienced bicyclists riding bikes in good condition. 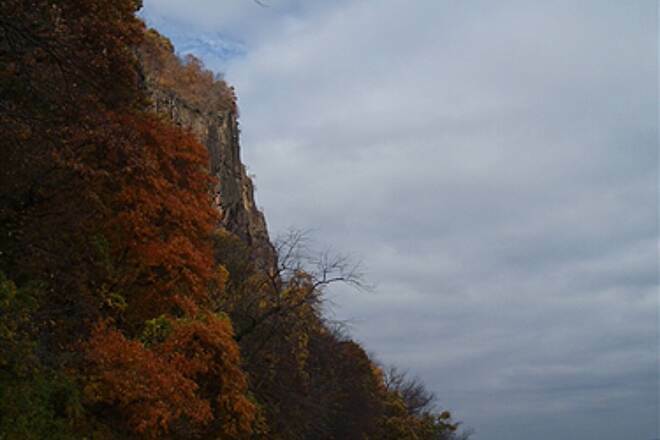 Great views of the Hudson River and Palisades Cliffs rock formations are available from either trail segment. 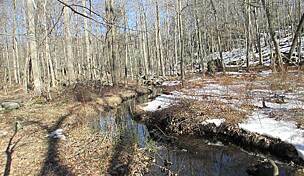 If you live in the Rockland County area this trail shouldn't be missed. 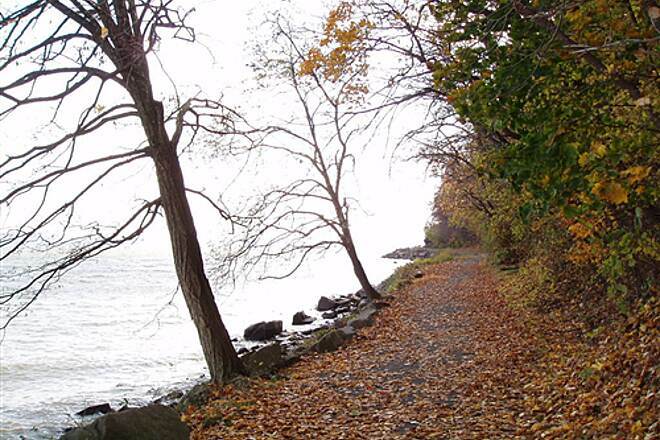 A parking lot is available at Nyack Beach State Park. 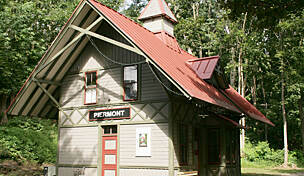 During peak season periods, parking fees are collected. 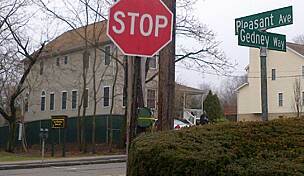 There is no on street parking in the Nyack area. Very limited on street parking is available in Haverstraw at the northern terminus. 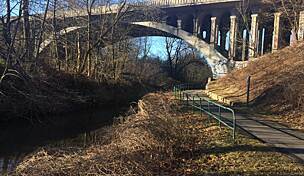 Possibly the most scenic trail in the Tristate area! Pictures don’t do it justice. 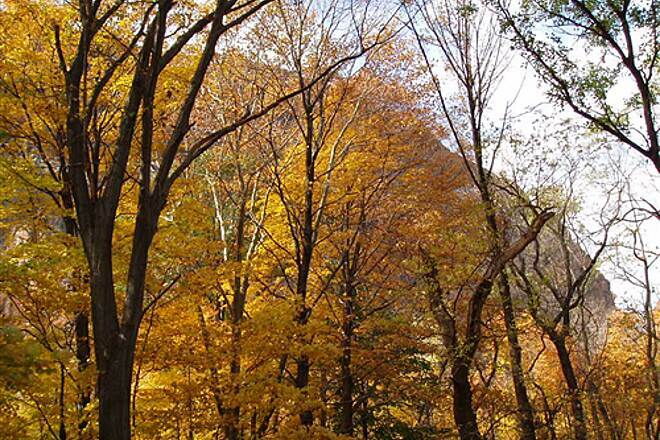 Get your mountain bike or cross country bike ready and hit this trail! First section of the trail is a bit busy with pedestrians, but it becomes nice and clear once you start entering the woods further north. Great ride from Nyack to Haverstraw and back, this is a hybrid/mountain bike ride...leave the road bike home. Scenic. Dateline: Sunday July 30. Sunny, temps in the 80's. 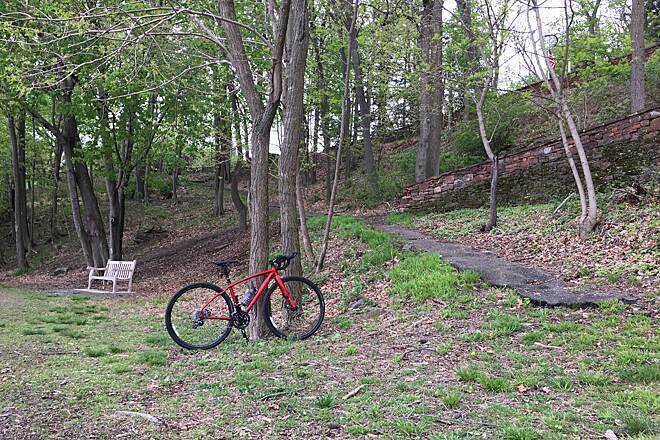 My hybrid did well on this mostly unpaved trail, but road bikes? Nah. 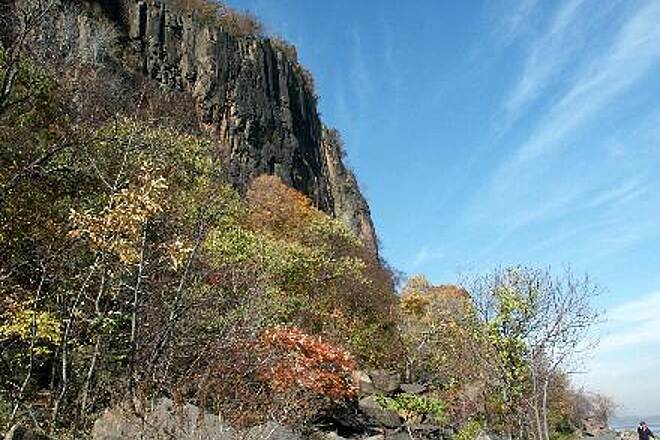 I started a cramped parking area in Haverstraw, rode the forested trail between the palisades of Hook Mt and the Hudson River. In Haverstraw everyone must pause to view the hundreds of stone busts of the artist in the house overlooking the river. 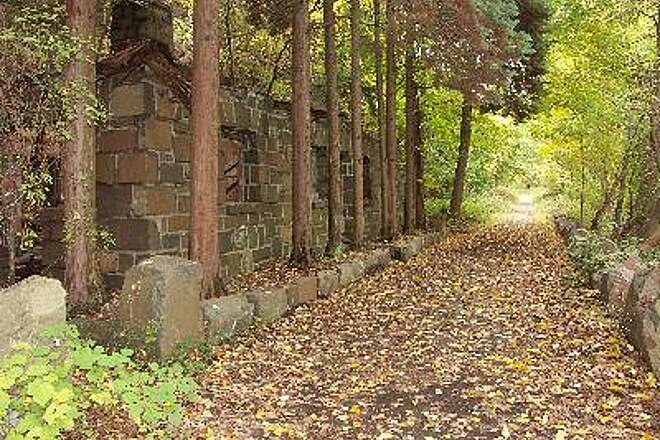 Along the way there are very old stone abandoned structures. 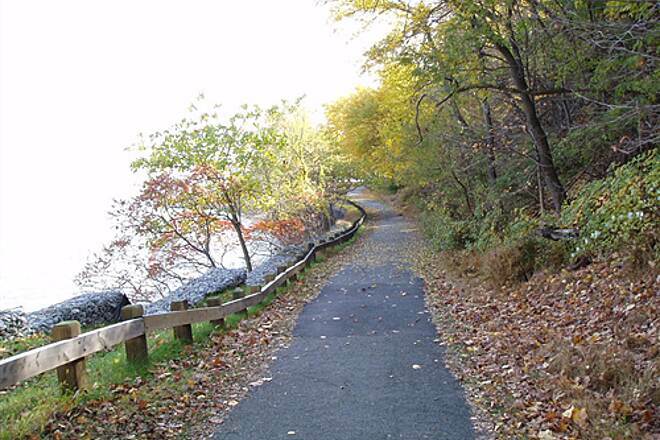 The Rockland county park at the Nyack end has more parking and is a nice place to refresh, right on the river. Riding from either direction has some real hills to traverse., but the scenery does make you want to stop anyway. 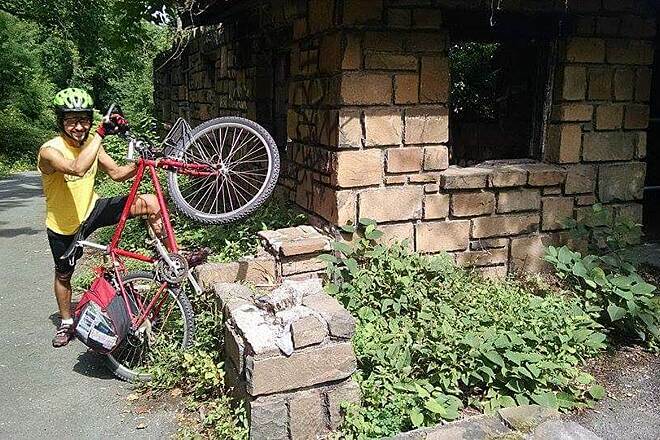 The last few years of construction was finally completed a few months ago and I was able to ride entire trail from Haverstraw to Nyack on my road bike (along with many other road bikers). It is just barely ok for experienced cyclists on the hilly northern section. But I tried it again on July 10 and the Northern section is closed to everybody while they do some heavy construction work. 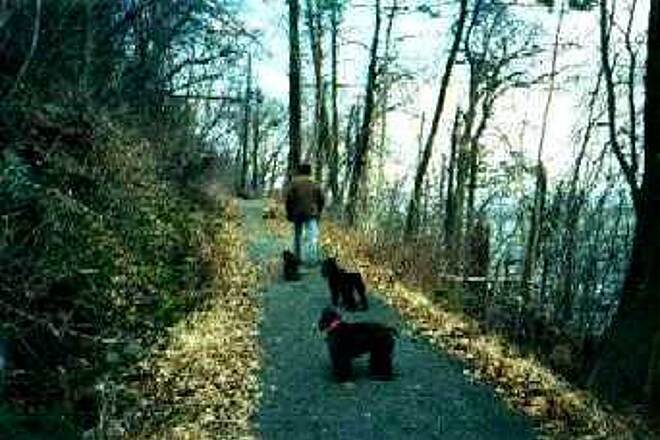 There is also a short section of construction on the path that leads up to Rockland Lake but that is passible by walking. 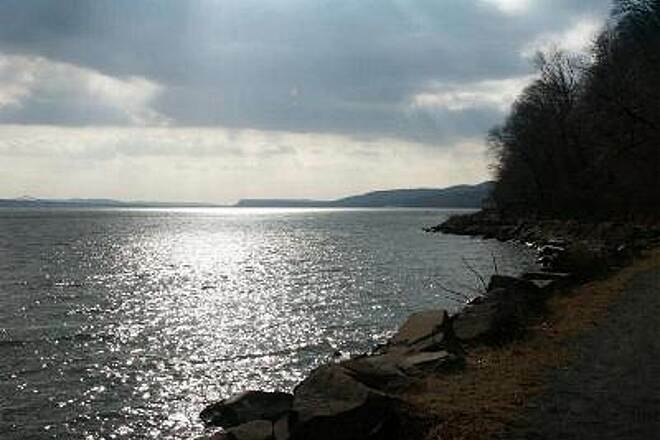 I rode the entire length from Nyack to the end at Haverstraw on my hybrid bike. It became a quixotic quest once I started, but frankly it was not fun, and maybe dangerous. A couple of steep hills, but numerous other rolling hills. On the downhills easy to pick up speed too dangerous for the crushed gravel surface. I never spun out or fell, but I can see that one could easily do so. 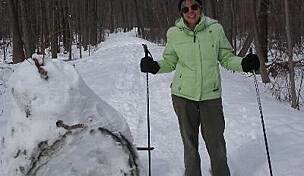 This was a scenic trail, but I was too busy white-knuckling to have the time ti take in the view! However, with a mountain bike it is probably a decent challenging ride. I'm a runner also, and would enjoy running on the trail. But no more biking for me, here. This is a great trail but please be aware that as of this posting there was no access at the southernmost trail head or at the River Road Entrance. I drove up to Monroe and entered there. At Monroe there is ample parking, a visible trailhead and the trail is paved at least as far as Goshen (where I turned around). Also There are no services on the trail until Chester so if you need a restroom go before you head out. Bring plenty of water as well, nothing till Chester. but, on the south bound, I lost control on the hill down where my bike slit down, causing sever injuries on my knee. 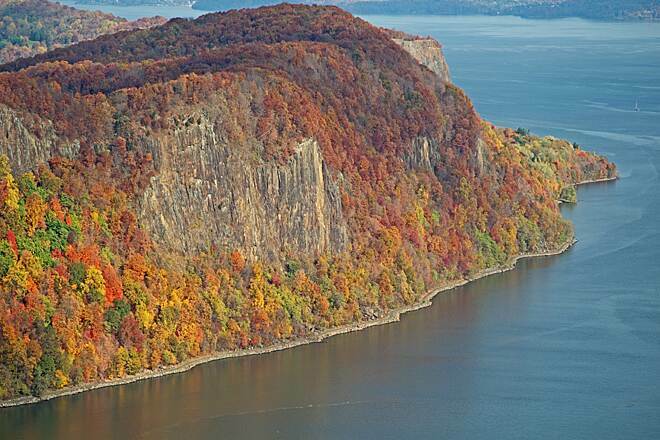 Beautiful views of the Hudson River Valley and Palisades Cliffs. Parking at the south end in Nyack Beach State Park was easy and free to park on the Monday we went (sign indicates a $6 parking fee). 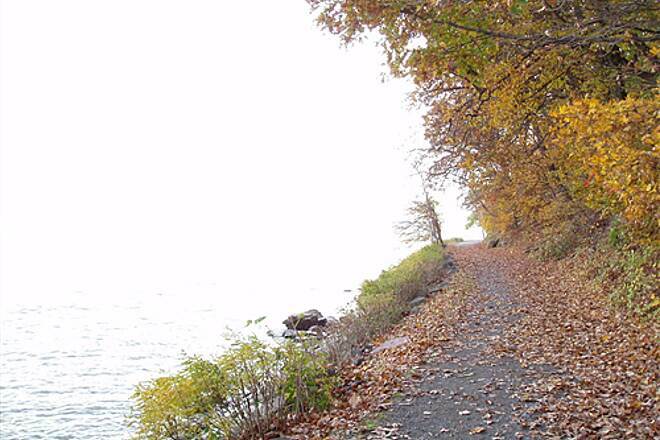 The first 2miles was flat, packed crushed stone surface, right along the Hudson. 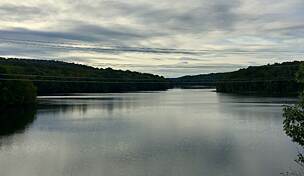 After the 2miles the trail climbs up to fork, right follows a paved road up steep hill towards Rockland Lake (200ft vertical), left heads back down to the river for another 3.5miles to Haverstraw. The trail is mixed dirt road, pavement, and mostly crushed stone. Rolling hills, sweeping turns, could be just outside the range of a beginner if going the whole distance. Overall this was an excellent trail with great views and easy/moderate riding. Traveled from NJ to do this trail on Sunday only to find out about 1/2 mile in it was blocked off. It seems Hurricane Sandy did a job on it and they have been doing construction since spring. 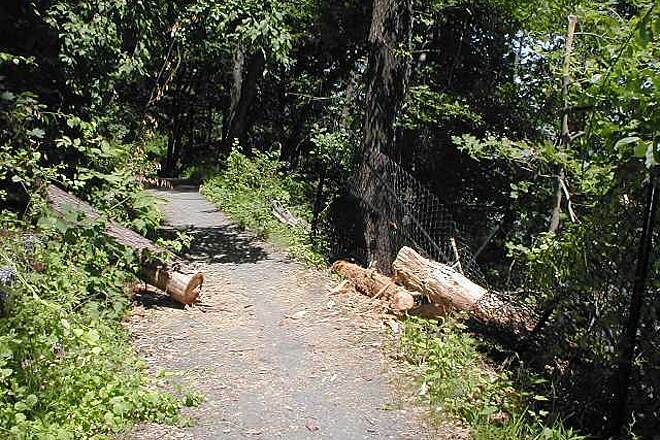 However,a Park Ranger says they are suppose to pave the trail and it should be open after 7/29/2013...yet to be seen. Otherwise biked as far as I could than took the road into town and returned to my car! looks like a nice ride along Hudson river....would have loved to see more! 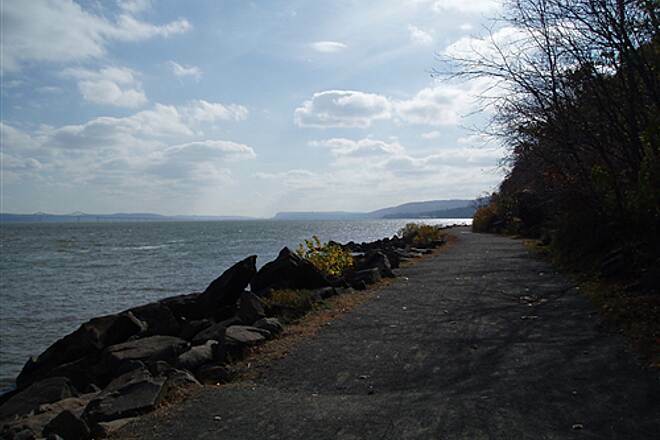 The trail along the Hudson from Nyack Beach SP to the junction of the Haverstraw branch is OFFICIALLY CLOSED for construction. 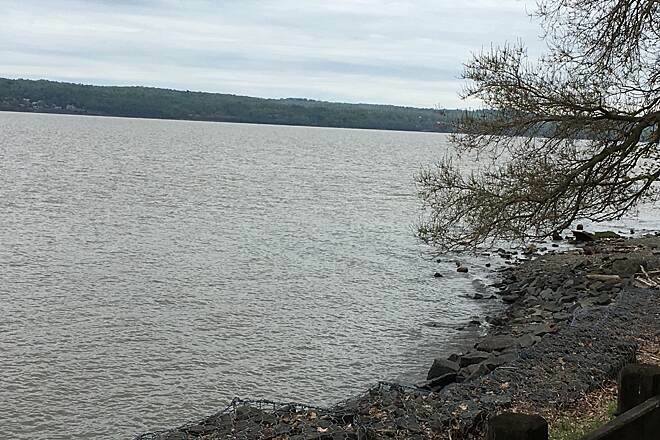 I was able to run the trail today, as there was no active construction in progress, and the trail was not barricaded at Nyack Beach, but was barricaded at the junction with the Haverstraw branch. The trail is being re-graded/resurfaced. I don't know whether the surface is going to be stone dust or asphalt. We rode the trail for the first time yesterday. It was nice to ride along the Hudson but there isn't as much to see compared to riding a trail through a more wooded area. 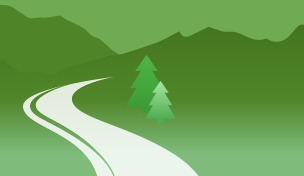 The trail is made of hard packed dirt, and paved areas. I think there were two areas of gravel that were a little deeper and loose than other areas but they aren't a problem to ride through. 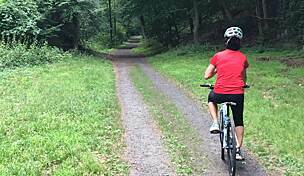 We were riding hybrid bikes, but I saw a couple of road bikes on the trail as well. I would recommend riding with a hybrid our mountain bike. There are a couple of areas where the gravel was loose and I can see road bike losing traction in those areas unless you take your time. There's one paved area that has a steep hill that took some effort to get up it. I made it to the top with some effort but I'm not in tip top shape right now. You can always walk your bike up or down without a problem if you find it's too steep to ride. 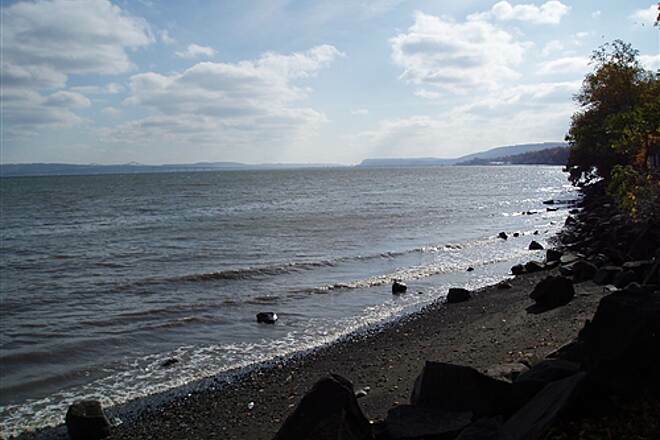 We parked in Nyack Beach State Park but it costs $6.00 so make sure to bring a couple of extra dollars with you. There's also a rest room in the parking lot and picnic tables. There were a couple of other picnic table areas along the trail under some trees and next to the Hudson River; it would be a nice place to come for a family picnic. I didn't notice it there were grills in those areas though. I don't think we will be going back to this trail though. 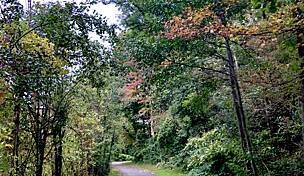 We prefer trails through more wooded areas like the Wallkill Valley Rail Trail. 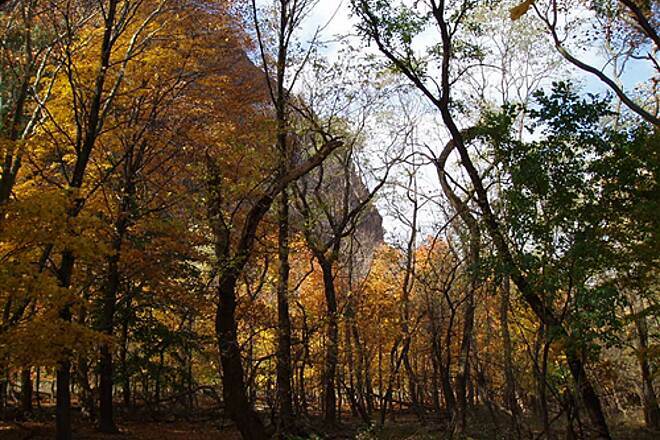 I suggest that you take a look at the trail for yourself, you won't know if you'll like it until you visit it. I just did this trail on road wheels (700 * 23c) and whilst I stayed upright and suffered no rim damage I wouldn't recommend it, nor do it again with anything less than 2" tires. The path grows less suitable as you travel north. The issue is that the front tire occasionally sinks into the asphalt momentarily making steering very haphazard. I've done enough off road riding to regain control, but 'road only' riders would likely take a spill in these situations. Fun trail with the right bike though. 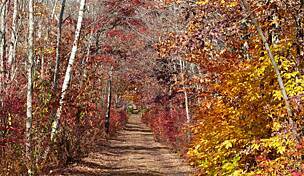 My family and I attempted to bike this trail last sunday, October 9. Sadly, the trail was closed about a mile north of the beach parking lot. Does anyone have any info or know when the trail will reopen? Pretty good for mt bike (easy/mostly flat), should be ok for hybrids, but wide tires recommended. 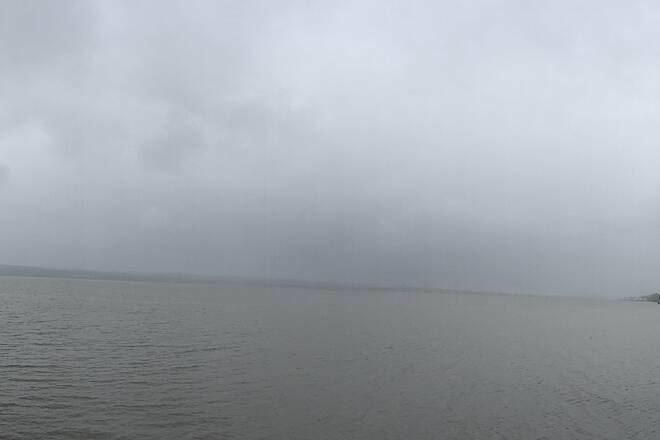 awesome views of the Hudson! very well worth the trip! 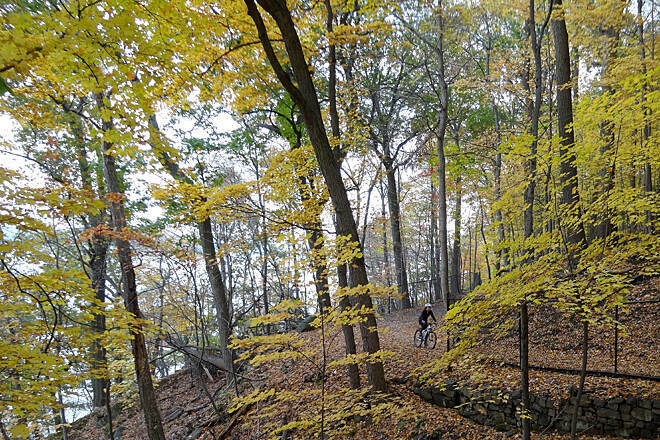 "Living in the area for nearly two years has given me the opportunity to ride the this trail several times. It’s a mostly dry, hard packed, gravel trail with rolling climbs and descents. 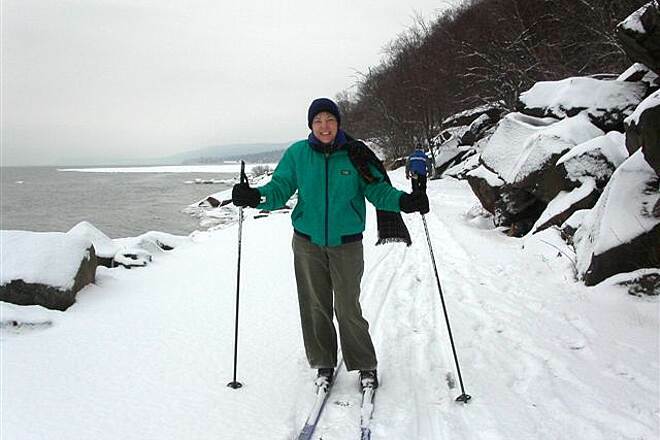 If parking is tight at Nyack beach an alternative place would be Rockland Lake State Park. 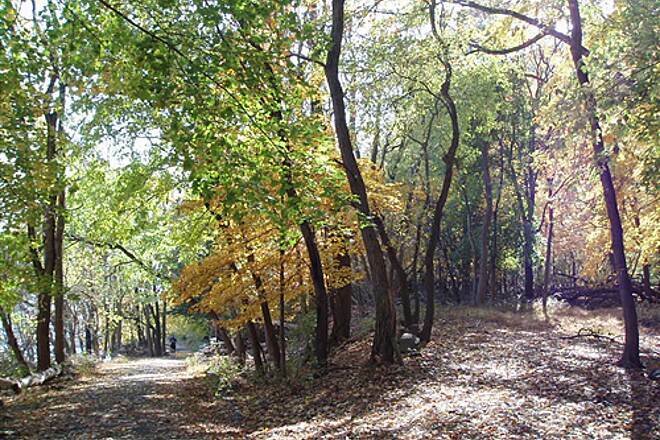 At the northeast corner of the park a road runs down to the trail. It’s a nice walk and a great ride. Along the route there are several old buildings. 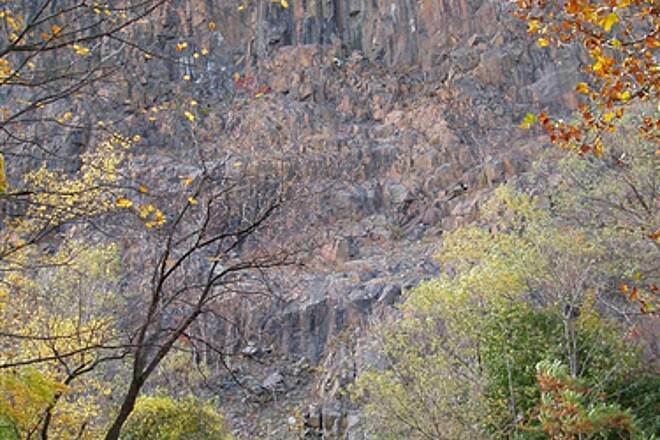 The stone work along the trail is truly special. Use caution, though, as there are some areas in need of attention. Lastly, if you are on a bike, stay on the trail; most of the single track is not rideable, or should I say, not enjoyable to ride." 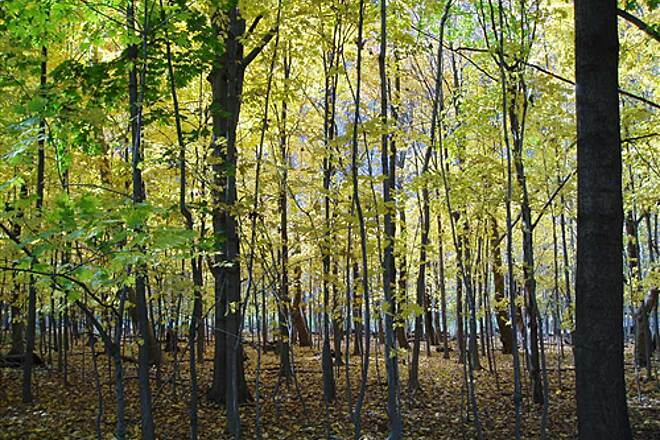 This is a beautiful but busy trail. On a warm weekend in March the parking lot was full. It was difficult to ride the first mile of the trail because of the crowds. I would recommend doing this trail on a weekday. Even if you have to take a day off it's well worth it. "The trail description says it all. 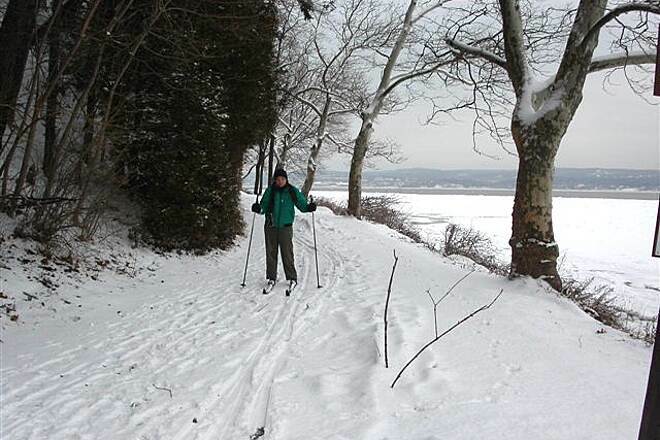 That is, if you live nearby or plan to travel through Rockland County, NY, don't miss this trail! 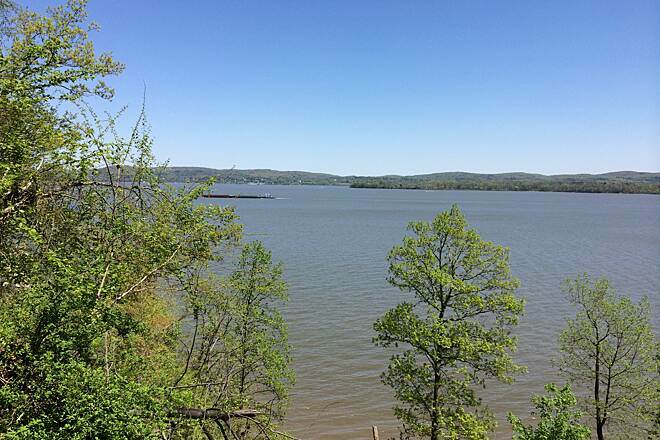 Absolutely breathtaking views of the Hudson River are available from either of the trail segments. 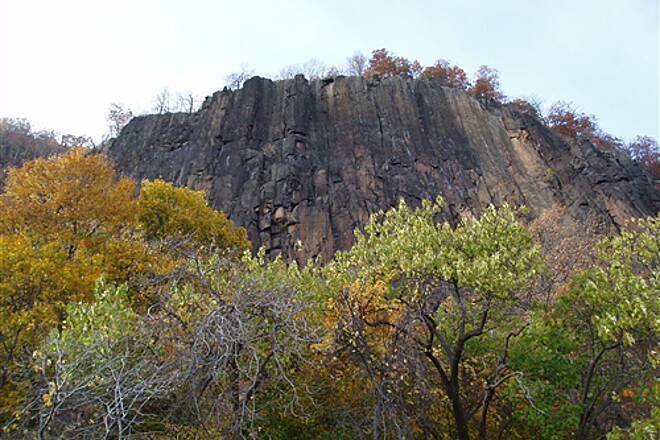 You will also want to bring a camera along to take photos of the impressive Palisades Cliffs. 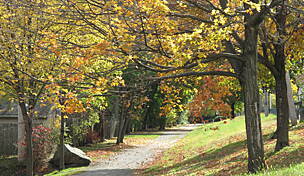 There are plenty of places to picnic along the lower trail, which is more family friendly than the upper one. Bikers with a fear of heights should not attempt to ride the upper tail as it comes very close to cliffs’ edge in certain spots. 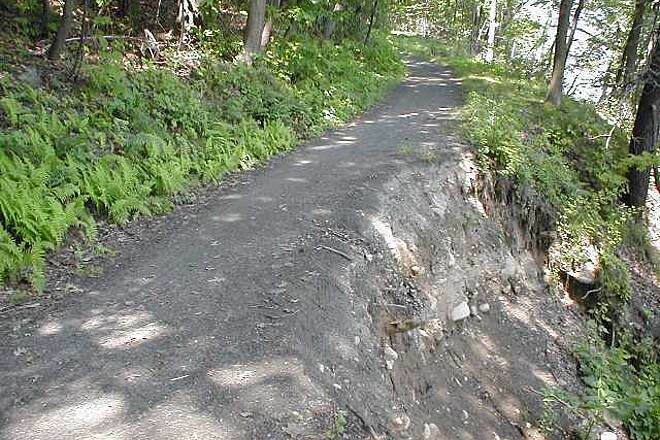 In fact, the upper trail should not be biked by those who like riding solo, just in the event that an unfortunate mishap should take place. 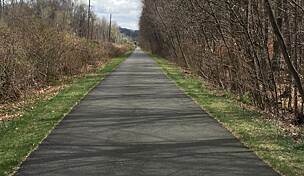 If you’re traveling from afar, plan to spend a day in the Nyack, NY area and ride this trail in conjunction with the Old Erie Path, Raymond Esposito Trail and the Joseph Clarke Trail. You’ll have a great full day of biking if you take in all three. Feel free to e-mail me for directions or further information. Thanks.